Families in England will find out on Tuesday whether their children have got into their preferred primary schools. Last year about one in 10 families missed out on their first choice – but 98% got one of their top three places. Primary schools have added 636,000 extra places since 2010 to meet rising numbers – but that demographic bulge is now moving on to secondary. Head teachers’ leader Paul Whiteman said securing a place can “feel like a battle for parents”. More than 600,000 families will find out where they have been offered a school place for the autumn. The national picture on applications will not be known until June, but the chances of getting a first-choice place have been improving in recent years – up from 88% in 2014 to 91% in 2018. There are big regional variations each year – with authorities such as the East Riding of Yorkshire, Northumberland and Rutland having more than 97% of families getting their first preferences. But the lowest success rates tend to be in London, with only 68% of families in Kensington and Chelsea and 77% in Camden getting their first choice last year. A population boom had put pressure on places – but that has peaked and this year’s application numbers could show a downward trend. For the past decade, primary schools have been building extra classrooms as pupil numbers rose by about 15% between 2009 and 2018, up to 4.7 million. The size of the average primary school grew by an extra 42 places, but this has not been spread evenly, with some expanding very significantly and with some areas still struggling to meet demand. Mr Whiteman, general secretary of the National Association of Head Teachers, called for a more joined-up “national strategy” to ensure enough places. Otherwise, he said, “the annual anxious wait for families will continue”. Mr Whiteman warned of a “haphazard” approach to expansion, so that “new school places are not always being commissioned in the areas they are most needed”. School standards minister Nick Gibb said standards had risen and the primary school sector was “unrecognisable from a generation ago”. He said 87% of primary schools were now judged good or outstanding, and the use of phonics lessons had improved children’s reading. “What this means in practice is that even in instances where parents aren’t getting the news they hoped for today, the likelihood is that their child will be attending a school which will provide a first-class education,” said Mr Gibb. But the New Schools Network, which promotes free schools, said too many children would still be heading for schools which were below the rating of “good”. 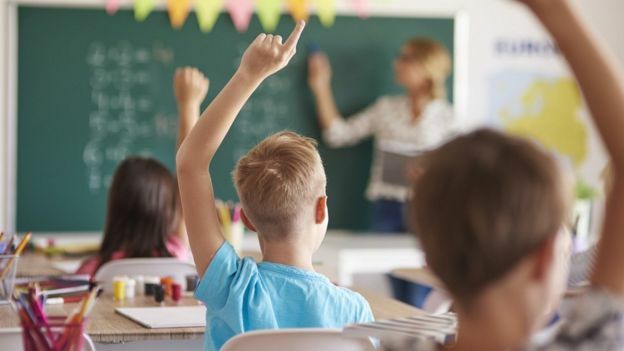 “Finding out which primary school your child is going to should be a time of excitement, but today nearly 100,000 families will find out their child is being sent to a school that isn’t good enough,” said the group’s director, Luke Tryl.